Samuel Hoffman | The Journal Gazette The K’s Cody Sol has racked up 450 penalty minutes over the past two seasons. 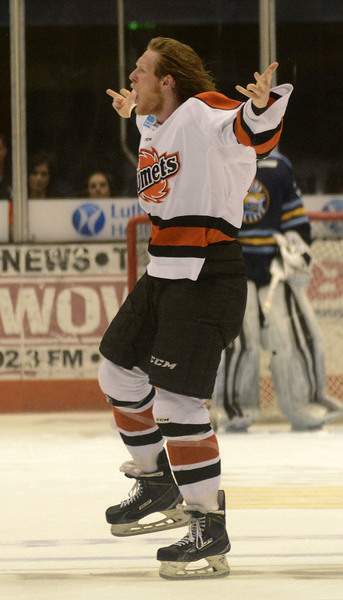 Cody Sol spent so much of his first two seasons with the Komets in the penalty box, it was sometimes tough to know just how good he could be on the ice. This season, he’s spending more time skating past the penalty box to celebrate goals with his teammates than he is heading into the sin bin. Sol, a 6-foot-6, 242-pound defenseman, has totaled one goal and nine points in 13 games for the Komets (8-3-2), who play their annual Thanksgiving Night game against the Kalamazoo Wings. Sol’s plus-15 rating is tied for the best in the ECHL with teammate Curtis Leonard and Manchester’s Justin Agosta. "It’s exciting to see it happening," coach Gary Graham said. Sol, 25, in his fifth professional season, has always been relied upon to bruise and batter opposing forwards and keep them from the front of the Fort Wayne net. He racked up 450 penalty minutes to go with 12 goals and 45 points in 165 games over the last two seasons. And he’s got one of the hardest shots in the ECHL. "I think he’s just playing with confidence," Graham said. "He’s a guy that has matured more every season. He’s doing a better job of controlling his emotions on the ice. We talked to him and we knew there was some offense to his game, it was just to get it out. We signed a tougher team this summer too, so we don’t need him fighting all the time. That was kind of the idea behind signing some of the guys that we signed, so he wouldn’t have to be the sole guy all the time." Sol, a fifth-round NHL draft pick in 2009 by Atlanta, still mixes it up plenty – he has 40 penalty minutes – but he’s got help. "I like playing both roles," Sol said of scoring and fighting. "It’s nice to have a balanced attack out there. But with the team we have here – including Bobby Shea and Will Weber and Taylor Crunk out front now – we have a lot of big bodies to hold our own." Losing offensive defensemen Jordon Southorn and Cody Corbett meant Sol had an opportunity to contribute more offensively than last season, when he had two goals and 21 points in 65 games and racked up 259 penalty minutes, more than anyone in the league except Alaska’s Garet Hunt (277). "I had a good summer," Sol said. "Grammer called me a couple times and told me that with a couple of the offensive guys leaving, I’d step into a bigger role this year. "I took that to heart over the summer to work harder and become a better player. I got some confidence. The guys in the room are giving me some confidence, too, and it’s nice to get some team chemistry going." Notes: As part of Military Appreciation Week, the Komets will wear special jerseys today and Saturday that will be auctioned to benefit the Military Families Program of Associated Churches. … Active military and veterans get a free ticket with a purchase of another this week. … For Komets Kare Package, bring donations of non-food items like gift certificates, games, magazines, toiletries, blankets and underwear veterans in northeast Indiana. … Saturday will be Report Card Night. Students with an A or equivalent grade will get a free ticket and a chance at a $1,000 savings bond for education. … The Komets are 1-1-0 against Kalamazoo (6-7-2 heading into Wednesday) and have an all-time Thanksgiving record of 34-17-4.